Print Up to 54 Different Face Designs Plus Your Custom Back Design! Your design and copy will be printed on the front and back of each card. 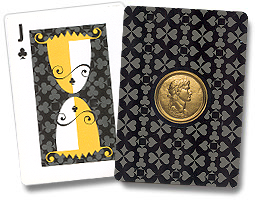 The minimum order for Custom Face Playing Cards is 500 decks and production time is 6 weeks after proof approval. For Custom Backs Only, the minimum for cards with 1 or 2 color images is 200 decks, for 3 or 4 color (full color) is 300 decks. For low quantity custom playing cards, please visit our Low Quantity Custom Imprinted Cards section. Custom Playing Card decks are individually packaged in die-cut cardboard tuck boxes with cellophane windows (Special Packaging is also available). Please Contact Us at 1-800-233-0828 for pricing and other information.